In case you haven’t noticed, burgers are not what they used to be. From gourmet to gross, burger joints across the country are working overtime trying to out top each other. To b honest, no one is complaining, as burger fans rush to get their hands around the oddities. Yahoo Travel went in search of the wackiest toppings, the tallest towers of patties, the drippiest, the gooiest, and the most insane burgers in the country. We looked for burgers that were crazy good as well as a few that are just plain crazy. Here is our list — approach with caution. Flip Burger Boutique is Chef Richard Blais’ burger fantasyland. If you reside in the south, you won’t think his Southern Burger, that features a chicken-fried patty, sounds strange at all. It may actually be genius on a bun. Pass the gravy, please. West Rib Pub & Grille has a burger on their menu called Seward’s Folly loaded with two pounds of caribou. The monster burger weighs in at almost five pounds with the toppings. Monkey Burger is not for light eaters. Every burger on the menu looks over-sized, but the meltiness takes cheese to new levels. The 2/3 pound patty comes topped with four cheeses spilling over the plate. Hwy 55 Burgers Shakes & Fries has a burger challenge for you. Wolf down their 55-ounce burger (that’s a mere 3.5 lbs.) in 30 minutes and it is on the house. Now that is crazy! Most of the burgers at Burger Aptos look crazy good, but the Bluto Brutus triple-stacked burger topped with a fried egg is insane. 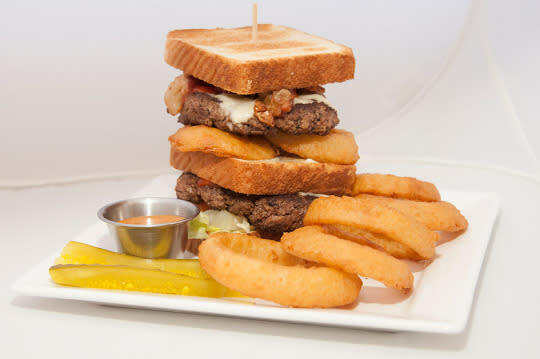 Crave Real Burgers is the place to go if the burger you crave uses grilled cheese sandwiches as buns. You can’t make this stuff up. Oh wait, there is a burger battle brewing here. 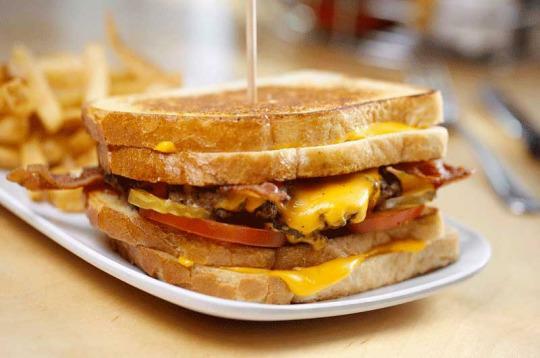 Artisanal Burger Company also serves a burger slapped between grilled cheese sandwiches. We know that Wayback Burgers is spreading across the country like wildfire, but it all started in Delaware, so we’re giving them credit for creating the Triple Triple. Nine patties. Nine slices of cheese. Burger n Beer Joint leaves us wondering where to begin with the crazy toppings on the menu. The grilled shrimp looks like a good idea, as does the fois gras. But don’t attempt the ten-pound Motherburger unless you bring friends. Tower Burgers serves up a giant tower of meat and toppings between Texas Toast that is crazy huge, but if that’s not odd enough for you, check out the donut and bacon burger. Stewz Maui Burgers made our list with their triple stack of six-ounce patties, but the Wailuku smothered in brown gravy is rather off-the-wall too, don’t you think? 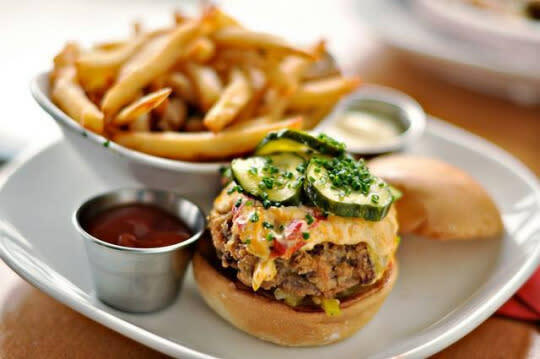 Grind Modern Burger is a case of gourmet burgers slipping beyond the norm. Their DMZ burger is braised beef rib topped with Kimchi slaw and Saigon sauce. Where do you even begin with the craziness going on at Burger Bar Chicago? The prosciutto and fried egg-topped Fa-getta-bod-it burger or the High Hog BBQ pork and bacon burger are both good places to start. Bru Burger Baris a small chain of gourmet burger restaurants with some amazing toppings on most of their burgers. We’re calling them crazy for their Farmstead burger topped with Brussel sprouts. Not going there. 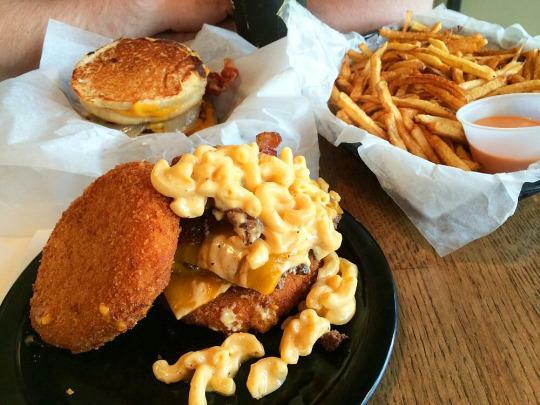 You know you are in for a crazy meal with a name like Zombie Burger, but are you prepared for the invasion of deep-fried macaroni and cheese burger? Perhaps you would feel safer with the UN-dead Elvis burger slathered with peanut butter, fried bananas, bacon, eggs, and cheese. Specks Bar and Grill is an assuming little joint with a challenge—eat their three-pounder with fries in 45 minutes and you can dine and ditch. The Station Burger Co. starts the craziness with the meat—they add bacon to the grind. Hmm… maybe that’s not so crazy. But the massive Station Chief Burger with a full pound of meat certainly is. 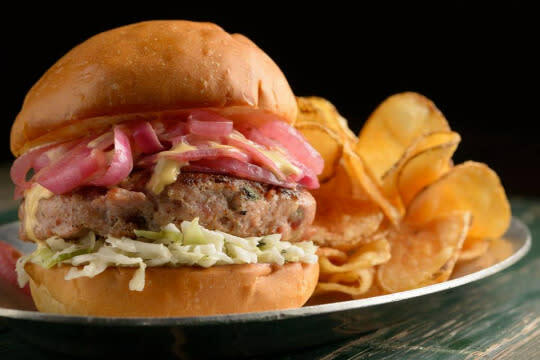 Bayou Burger is where you go for your favorite alligator burger. Not for you? Maybe you would prefer the deep-fried burger topped with fried pickles and fried onions. Nosh Kitchen Bar in Portland takes junk food to new places with the Slab Burger using pizza slabs in place of the bun. Mother’s Grille has so many crazy burgers on the menu you can go crazy trying to decide. Maybe you want your burger topped with crabmeat, or maybe with a chilidog. The ultimate craziness here though, is appropriately called the Heart attack—deep-fried and oozing with cheese. Eagle’s Deli is the place to go if you are in the mood for an enormous burger. The big boys here start at one pound and go all the way up to a six-pound monster loaded with twenty-four slices of bacon and twenty-four slices of cheese. 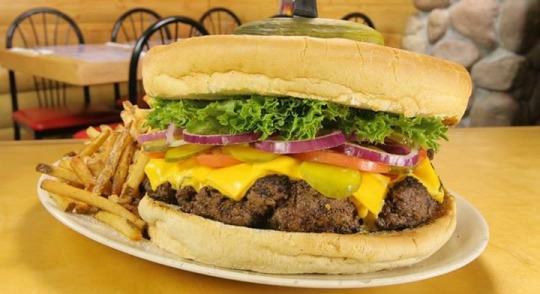 Mallie’s Sports Grill & Bar practically invented the crazy burger in the form of the world’s largest burger—certified by Guinness Book of World Records. Burger Jones has some good-looking burgers on the menu, but our attention focused on something called the White Trash Double Wide topped with chicken-fried bacon, fried cheese curds, and Velveeta. Burgers & Blues serves up a hot mess on a plate they call the Fry Burger—topped with Ranch dressing, bacon, jalapenos, American cheese, queso cheese, with fries piled on top for good measure. Compared to some of the wacky burgers in the country, Krumbly Burger’s loose meat burgers seem pretty tame—just oddly different. Once you have had your burger this way, you may never go back. Heap Burger’s menu is relatively normal, until you get to the fall special topped with spaghetti squash and maple syrup in addition to bacon and cheese. Sinful Burger labels their burgers with the seven deadly sins. Greed and Gluttony top the list of crazy burgers here. What would a list of way-out burgers be without an insanely expensive burger? Burger Brasserie at Paris Las Vegas serves up what may be the priciest burger in the country. The 777 burger has a jackpot price tag of, you guessed it — $777. Yikes! At least it comes with a bottle of Dom. Papa Joe’s Humble Kitchen serves a burger destined for your arteries. The secret ingredient on Skip’s Cardiac Burger is the salami. Urban Burger seems like any other upscale burger bar until you see the crabby patty—topped with a crab patty, avocado, Pico de galleo, and chipotle sour cream. In New Mexico, there apparently is no need for burger shenanigans because the world’s best burger comes from here—the green chili cheeseburger. If you visit the Land of Enchantment and do not try one, you are certifiable. 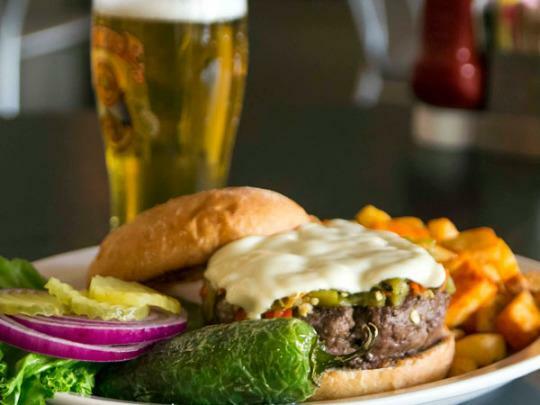 There are several standouts across the state, including Dave’s Burgers & More, Buckhorn Tavern, and Santa Fe Bite. Want caviar on your burger? Serendipity 3 thinks you are not crazy at all. They have you covered. Burger Warfare Gets extra points for burgers with wacky names. We especially like the Cuban Missile Crisis—chorizo between two patties, topped with Paprika Mojo sauce, and shoestring potatoes. 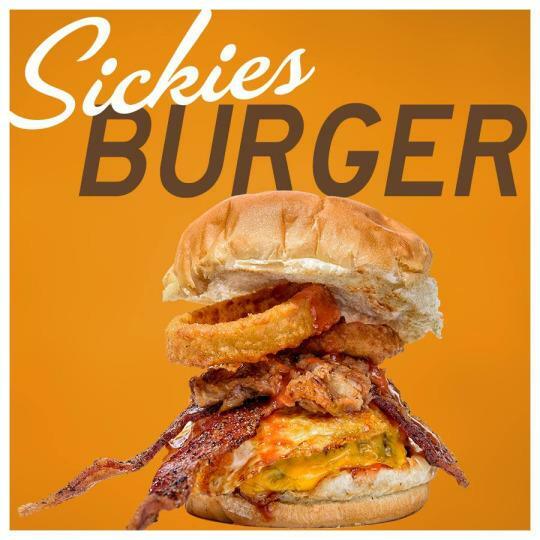 Sickies Garage has a signature burger that combines breakfast and lunch unlike any brunch we have ever encountered. The burger comes topped with bacon, fried egg, pulled pork, BBQ sauce, and onion rings. Is that one meal or three? 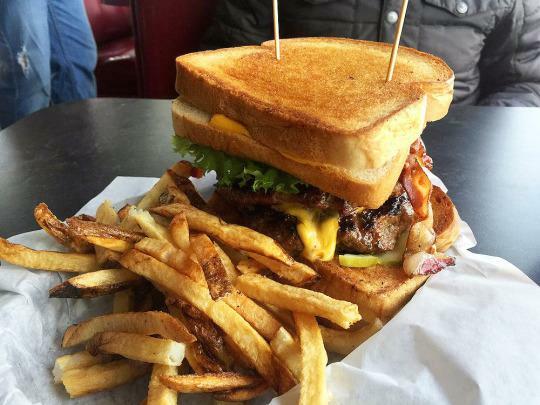 Thurman Cafe is home o the Thurminator, a colossal burger that’s made of (take a deep breath): TWO 12 oz. burgers, mushrooms, onions, ham, bacon, lettuce tomato, pickle, banana peppers, mayo, cheddar, mozzarella, and American cheese! Little Mike’s Hamburgers serves the original onion-fried burger. The oddity here is something called a Caesar that overflows the bun with made-fresh Caesar dressing. Reverend’s BBQ serves something called The Good Reverend Burger—burnt brisket ends and pimento cheese. Alrighty then. PYT is a seriously demented burger joint. The geniuses here combine wacky things every week into something burger-like. 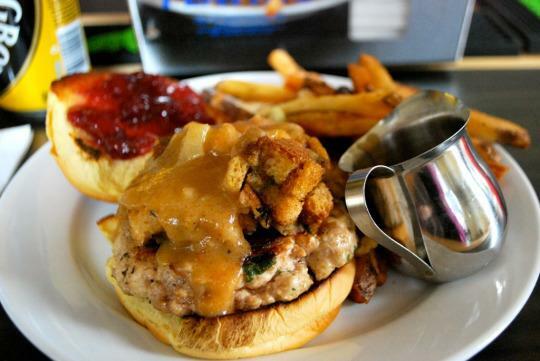 Think Eggo sliders and Coco Krispies in a chicken burger. Crazy Burger definitely has some interesting combinations on the menu. The Whassupy Burger, spiced with wasabi powder and topped with wasabi-chipotle mayo is at the top of the list of uniqueness. Joey Doggs Burgers and Fries serves rather normal burgers—in dog dishes. Black Hills Burger & Bun Co. might have some of the best burgers west of the Mississippi, but the Hot Granny lets you live on the wild side—topped with bacon, cream cheese, fresh jalapenos, and sweet jalapeno jelly. Kooky Canuck serves up the Kookamonga Challenge of a 7.5 pound, 12,000 calorie whopper. Eat in an hour and it’s free. Arnold Burgers is an unassuming burger joint in Amarillo where you order by the inch. Feed the gang with burgers sized between 9 and 24 inches. Or order a Texas-shaped or holiday bun just for fun. How many burger joints do you know with a Pinterest page? Burger Bar Utah is not your average drive-in. This is the place to try exotic meat burgers like elk or goat. The Famous Snow Shoe Burger at Snow Show Lodge and Pub is topped with bacon, pineapple, bleu cheese, and Vermont cheddar. Sounds like an explosion of flavor. Citizen Burger Bar serves a community conscious burger, but gets wild with their toppings. How about pork belly, black onion, fried egg, garlic aioli, and truffled brioche for a combination? Tipsy Cow Burger Bar feeds your alter ego. Here is what they have for the rock star hiding within: a 7-ounce patty topped with brew-battered and fried bacon, maple syrup, white cheddar, fried egg, caramelized onion, and lettuce and tomato, of course. Fat Patty’s has a name that is a huge clue to the strange delights that await you between buns. How about the Raspberry Popper Burger or maybe the Lasso Patty that puts the ham back in hamburger before drenching it in BBQ sauce? At Spats Food & Spirits, the Irish weigh in with their own burger here topped with corned beef and sauerkraut. 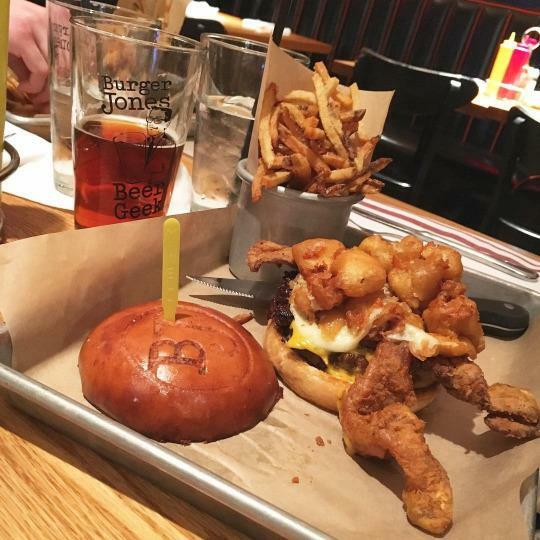 The Bird serves burgers with interesting names like “Ghetto on a good day,” “filthy harry,” and “the big crack,” which comes so loaded with toppings that they can’t even tell you what they are.